The DFS II R Series is available with a remote SLC load cell, dedicated to the unit to offer the ability to test in locations where a fixed and integral load cell is impractical. This digital force gauge allows the user to change SLC load cells adding the flexibility of having one base indicator and several load cells to meet different testing needs. The Chatillon DFS II R Series supplies all of the features of the DFS II in a package that provides the user with flexibility. This digital force gauge is available with a remote SLC load cell that is dedicated to the unit, and offers the ability to test in locations where a fixed and integral load cell is impractical. The DFS II R digital force gauge is compact, easy-to-use, and designed for basic and complex applications. Ideal for handheld or test stand applications, the DFS II R may be equipped with integral load cells or smart remote sensors for load measurement or torque measurement. Measurement accuracy is better than 0.1% full scale in integral load cell or dedicated remote models. 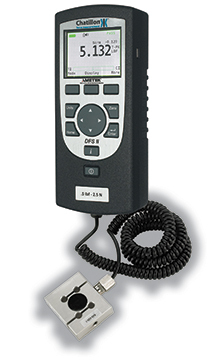 A large, easy-to-read, high resolution, full color dot matrix LCD display supports a variety of standard gauge functions including normal and peak readings, high/low limits, set points, pass/fail results, statistical results, load averaging, load comparisons, % and sharp break detection, load cell actuation, and direction. The easy-to-use ForceTest software comes FREE OF CHARGE when buying a DF II Series digital force gauge. Download the free ForceTest software trial here to experience how easy it is to use. Find out which adapter you need for your DFE II R digital force gauge in this Connection Diagram. Find the Declaration of Conformity for the DFS II R Series force gauge here. Firmware Version 1.06 26-Jan-18. Removes Bluetooth communication and settings. Fixed: Auto-dimming behavior to match version 1.04.